I find it quite troubling that after the many declarations of skills, talents, ability, wisdom, knowledge and understanding herald by African peoples past and present world wide for millions of years on this planet, that we, having only been under the USA/European Slavery system for some four+ hundred years, have devolved to the point of choosing a leader because he is black, and there ain’t nobody else out there. What has this whole nation become? A nation of take the lesser of two evils?? Why do we have to choose evil at all?? The President of the United States is not only representing African people, but supposedly he is a world representative and in some perceptions, the representative of the greatest country in the world, a world leader, et al, and we vote for him simply because he is black, or we feel we are taboo to express our concerns over the policies of this man in black skin. How is it that on his watch the US has engaged in 3 war campaigns, drone attacks on other sovereign countries and what we saw without regard in Libya, sending troops deep into Africa, and now this Kony thing? These are military operations and we all know what military operations look like. Why is there no challenge to this, or, if folks are so happy about the Health Care legislation, much of those dollars that are spent on war could certainly be spent here in the US, and build infrastructure and develop genuine green energy. Why is it okay, to look the other way, and say, well, he is black and he is all we have and we have been fighting for our seat at the table for 4 hundred years, instead of looking at the table, see what is being served, check out the room the table is in, then look outside at the neighborhood? Have we become so desperate for leadership, that we will take anything that is thrown at us? Why are people ignoring the aides, backers and financial supporter of Pres. Barack Obama? Why are they stepping over this elephant in the room so they can claim they lived during the time when a Black man was President of the United States. There have been many African Presidents, Rulers, kings and monarchs, does that mean that they too were above reproach, and therefore their misdeeds could be overlooked, and no one is ever called to task? Is that what happened to the many African nations that have dropped the ball on their developments because the people did not, would not see beyond the corruption? Again, it is quite troubling to me, that the reason folks are voting for Obama again is because he is black, or, on the other side of the aisle he is being mis-treated by them white folks who don’t want to see no black folks get anywhere. Folks we need to wake up. The fact that he is still in office proves that the “Important White Folks who run this country” want him there. The media talking heads are all on board the good ship lollipop because they are being told and paid to do so. As soon as the tied changes, they too will change and pull out all the dirt and grime they can. Bottom-line, it is flimsy to support any person in such a high position because of their ethnicity. Since these people will be on the front lines for all folks in this country, they need to have top notch skills to maintain that position on the front lines. They need to know what is going on domestically and globally as it relates to economic, politics, world affairs cultures, religions, societal norms, manners, and etiquette, along with a strong sense of the seriousness of their position as it relates to world peace and maintaining a peaceful environment at the home base. They need to be scholars in all the fields that are needed to govern a whole nation properly. This may sound like a tall task but if they are at least familiar with the nuts and bolts of this kind of leadership, they will call around them folks to advise them that are highly eligible to advise a President. In this way, when they receive advise that is non-supportive of the original agenda, then they can make a determination and have the person step down from the position of adviser. The President should be keenly aware that the decisions he makes will reflect back on him and not on the advisers behind him. So they should be chosen appropriately. This will probably sound rather idealistic and probably unrealistic, but my point is that we need to get there in our own discernment, before we take this ship down to hell!! 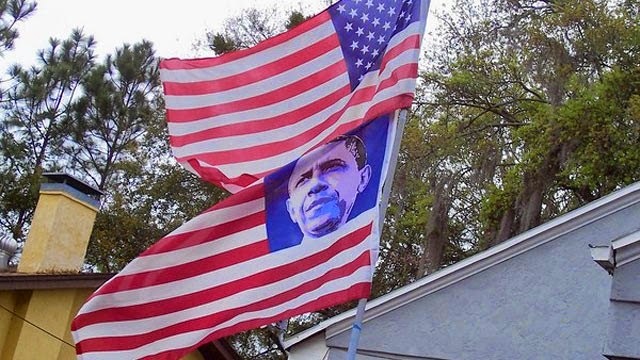 Waving an American flag with Obama’s face on it!!!!! What does that mean?? ?